Missouri's right-to-work bill flopped with voters. Voters have killed Missouri's right-to-work law before it even got started. The union-weakening proposal was passed by the Republican-led legislature and signed by Eric Greitens during his short-lived gubernatorial tenure. But labor unions aggressively fought back, putting it directly in front of voters, who shot it down today. The Associated Press, among other outlets, called the race with roughly 50 percent of precincts reporting. At the time, Prop A was failing 37 percent to 62 percent. Final, but unofficial election results show the measure ultimately went down to defeat, with just 32.5 percent of voters backing the legislature's decision. Sixty-seven percent said "no way" to Prop A. Prop A would have allowed workers to opt out of joining unions and paying dues, even though they would still be represented by the labor organizations in contract negotiations. Unsurprisingly, that was not an arrangement those in collective bargaining wanted to see. 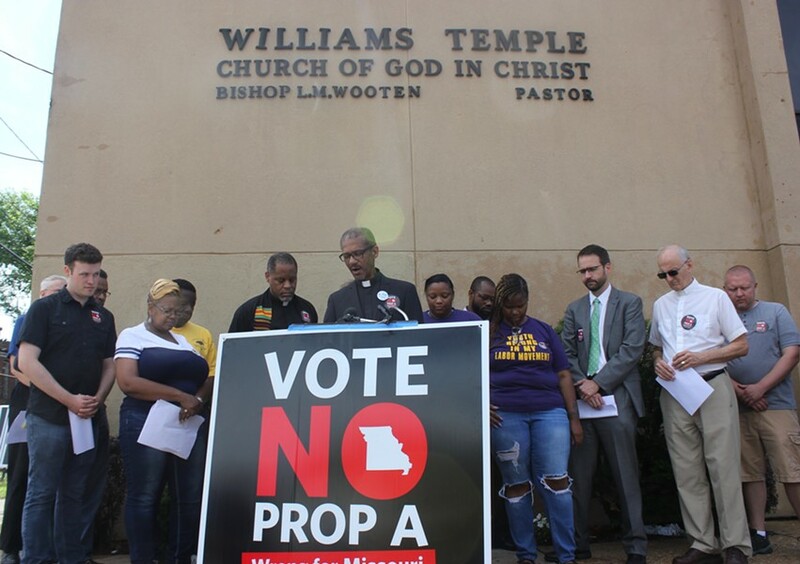 In a massive campaign — you may have noticed all those Vote No on Prop A signs — labor leaders and progressives argued the measure would pull down wages and hurt workers. Supporters of Prop A countered that Missouri would lose industry and jobs to nearby right-to-work states, including Illinois. But it was also a battle in the larger political context of conservatives and liberals, with Republican's hoping to weaken typically left-leaning unions. Today's vote was good news for organized labor, especially following the U.S. Supreme Court's split decision last month to let public employees opt out of paying union dues.